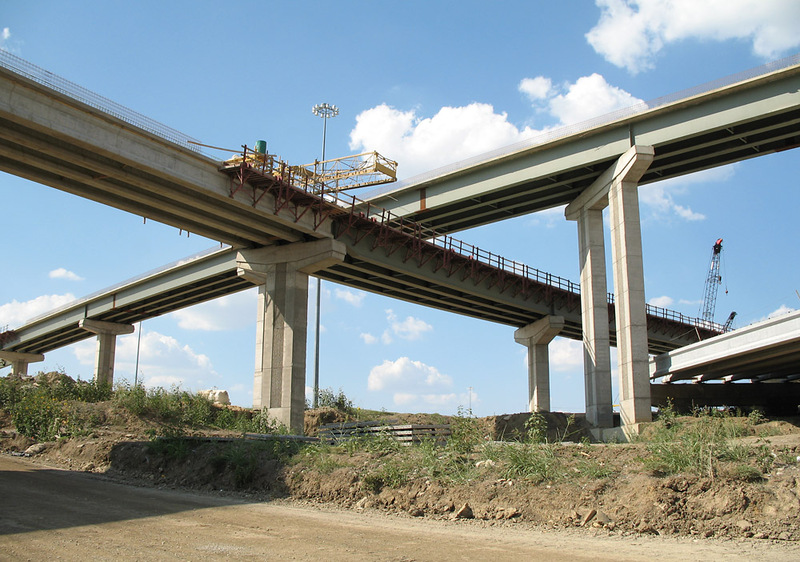 Photos taken July 16 (Interchange) and November 18 (frontage roads), 2006. 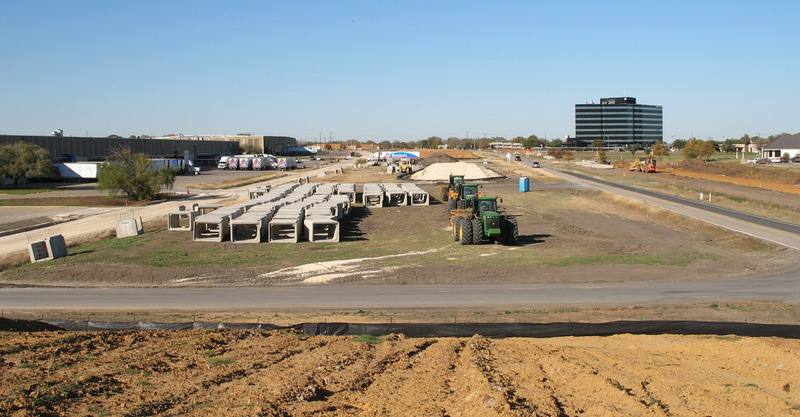 Work is proceeding quickly on the frontage roads through Grand Prairie. 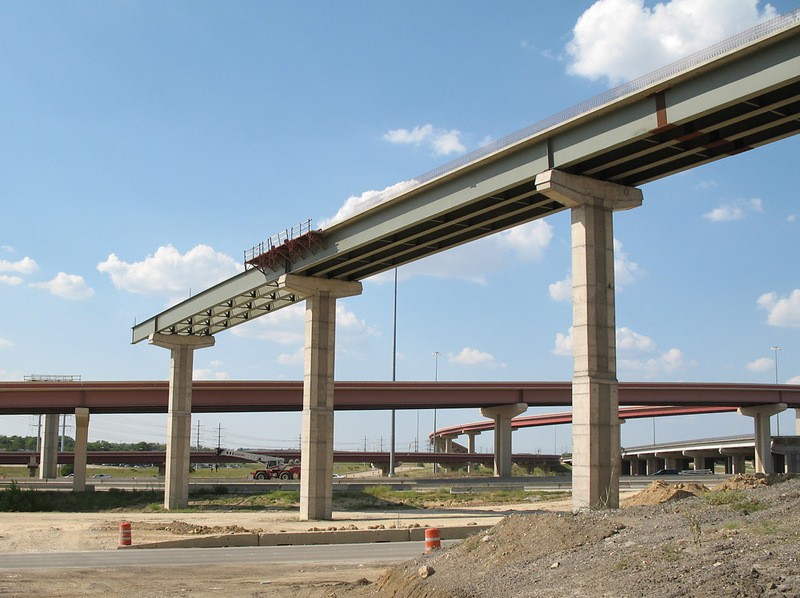 The section just south and north of Interstate 30 is the segment that generated controversy and litigation, holding up the project for around 20 years. 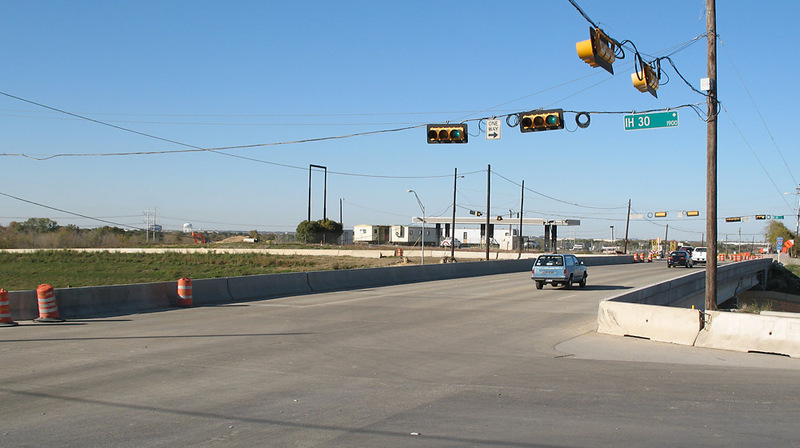 Now work is proceeding quickly and construction of the tolled main lanes will follow soon after the frontage roads. Looking south at Pioneer Parkway. 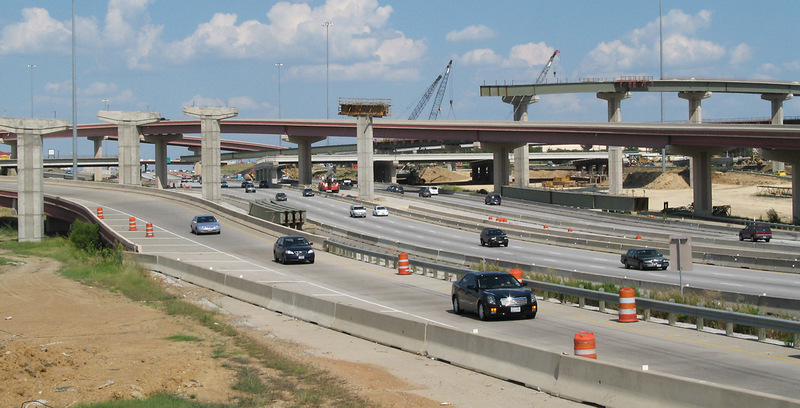 The section south of Pioneer Parkway is a separate construction contract which is now nearly complete. 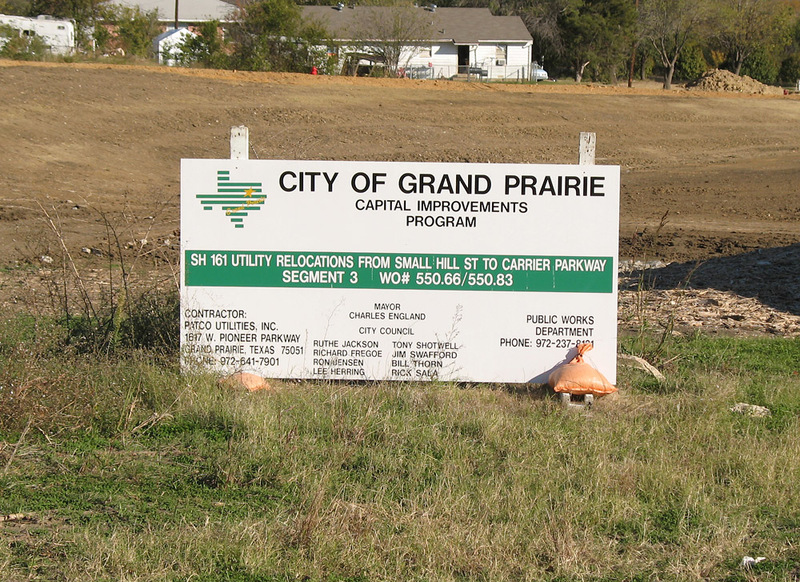 Photos of this project from May 2006 are on a separate page. We will proceed north from Pioneer Parkway, where work is just getting underway. Looking north at Pioneer Parkway. Driver's view at Marshall. 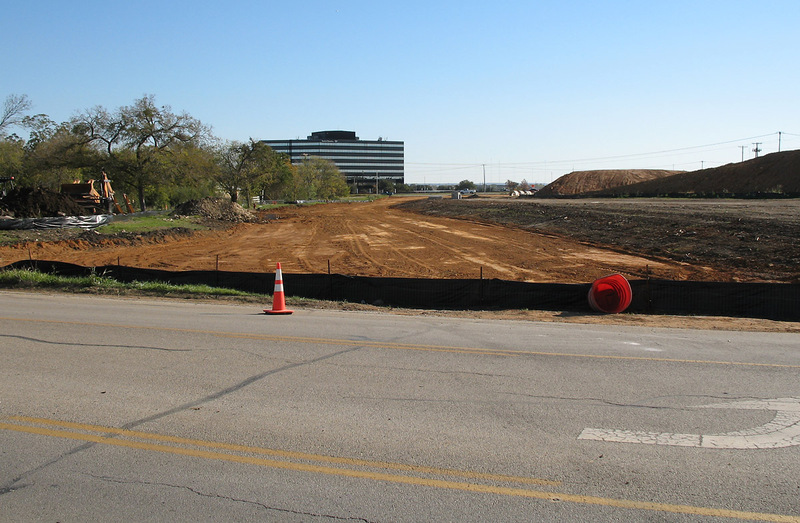 The two-lane asphalt road will be replaced by the frontage roads and eventually wiped out by the main lanes. In the above photo you can see a strange structure on the right. 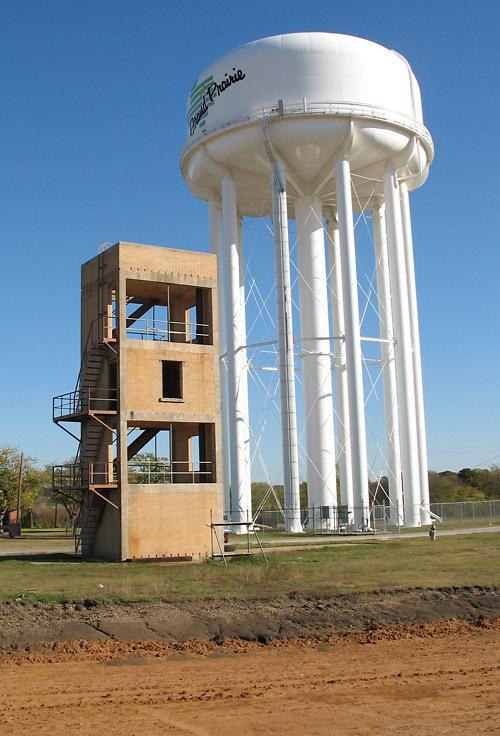 (Possibly a fire department training facility?) Here is a closer view. The new northbound frontage road comes very close to it. I'm guessing that the structure will be demolished. At Dickey/Robinson road we get a good view of the right-of-way of the new facility. 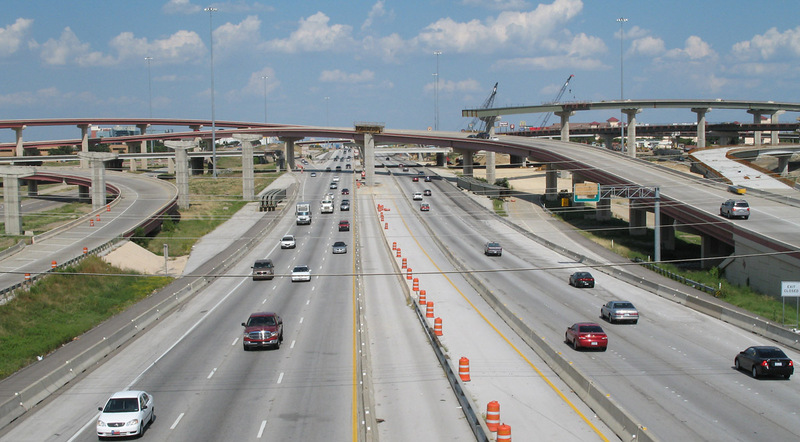 Although the existing road is only two lanes, it has been signed as "West Freeway" for some time. Looking north just south of Jefferson, which runs alongside the railroad. Driver's view on the existing road, approaching Jefferson. This location will eventually be the northbound main toll lanes. The existing road stops at Jefferson. Ahead the freeway blazes right-of-way on new location. 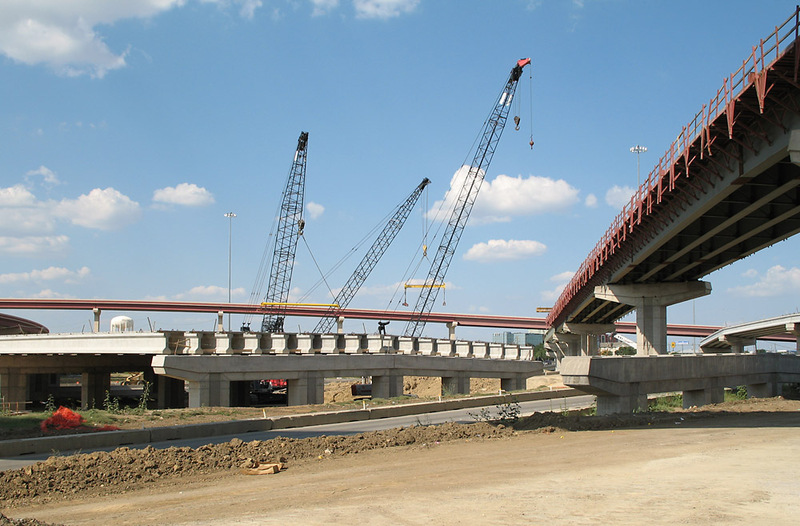 For 2004 photos of the right-of-way clearance, click here. 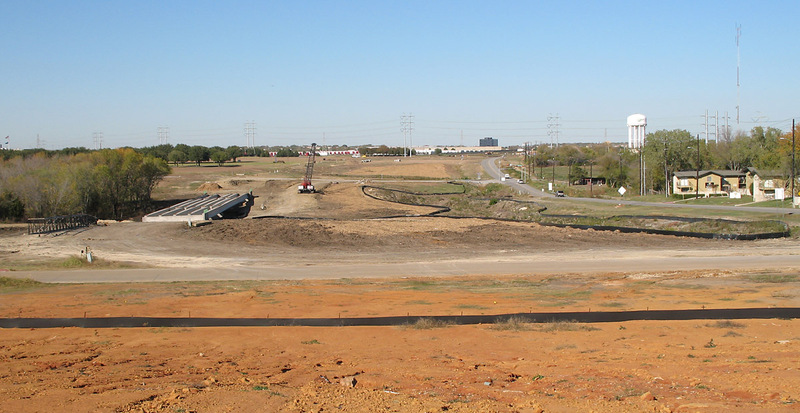 This view looks south at Dalworth along the future northbound frontage road. Looking north at Dalworth. 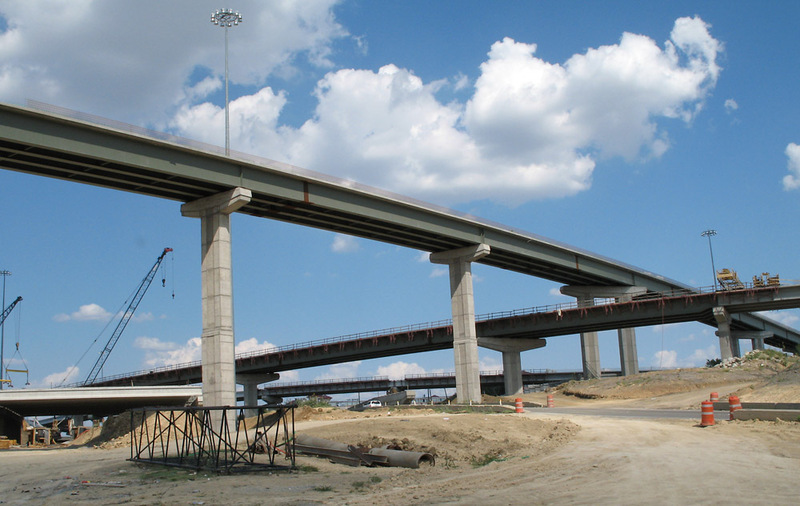 The highway cuts through a lower-tier residential area, and this section was one of the main sources of controversy and litigation that delayed the project. 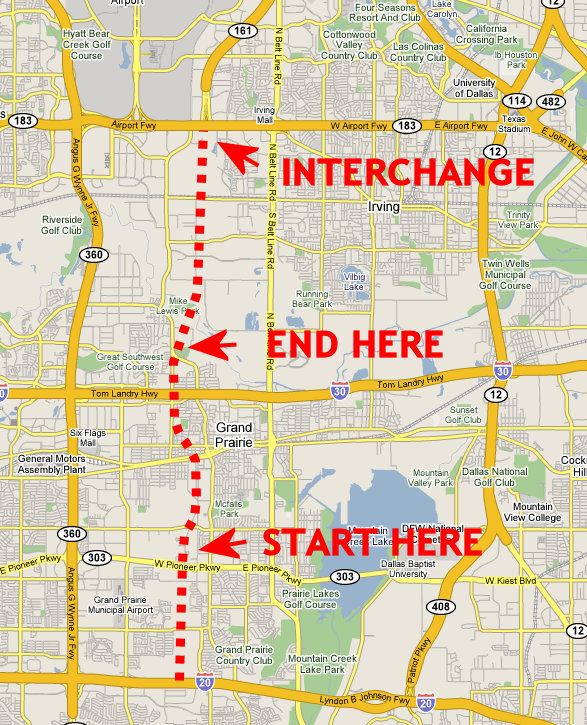 The freeway is on the approach path for DFW Airport. 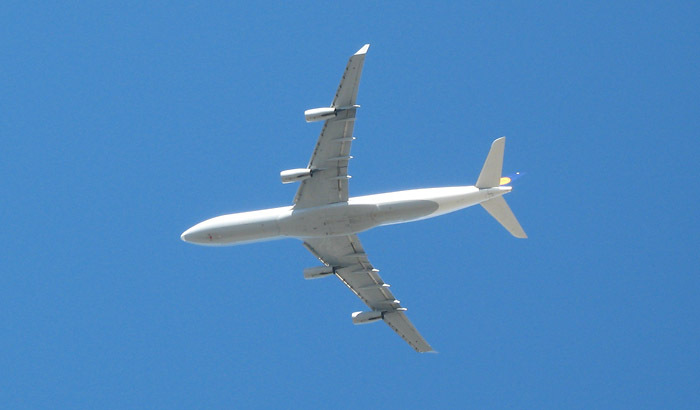 When I took the photos in mid-afternoon, numerous flights from Europe were arriving including this Lufthansa Airbus A340. Further north, this view looks southeast. This view looks northwest with 19th Street crossing ahead. 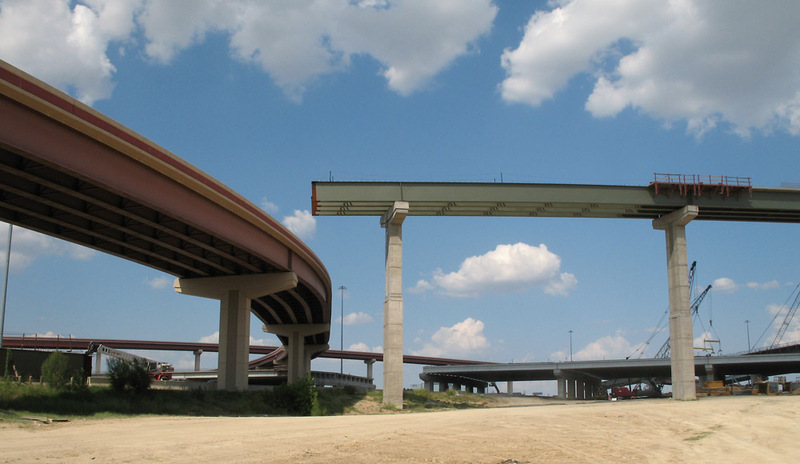 Highway 161 curves to run parallel to 19th Street. This is a driver's view northbound on 19th, showing where Highway 161 merges in from the east. 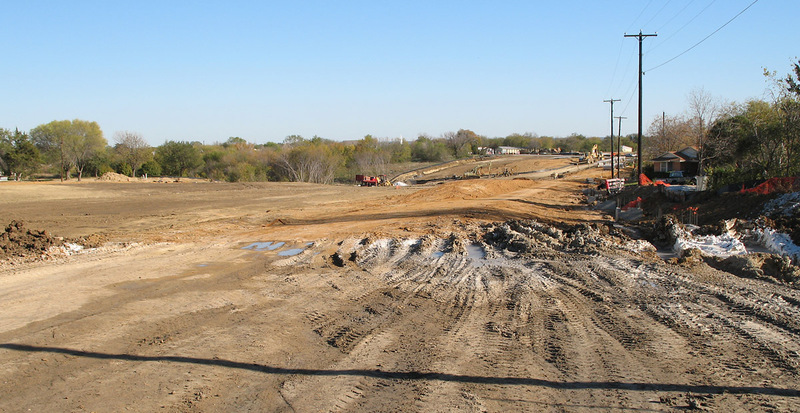 This view looks southeast, showing where Highway 161 crosses 19th. This view looks north at the concrete batch plant just south of Interstate 30. At Interstate 30. A five-level interchange will be built here. 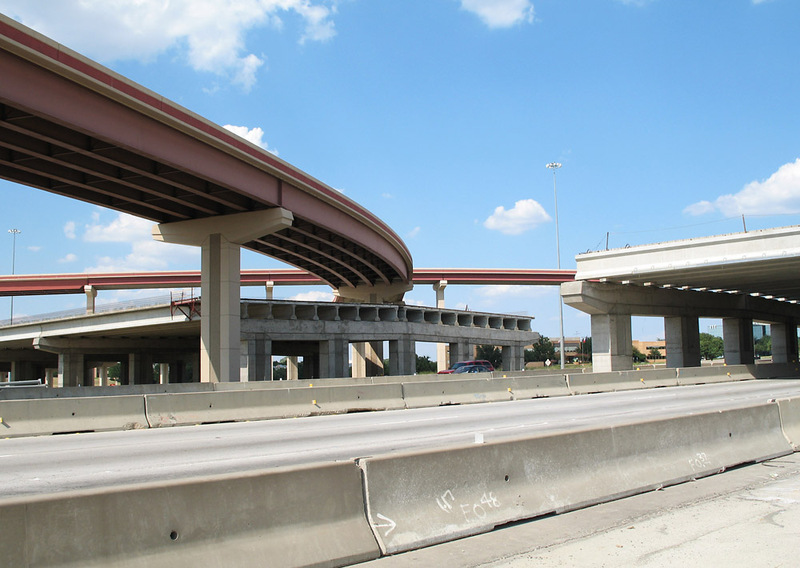 The will be the first interchange in Texas where the frontage roads are on the third level. North of Interstate 30 the right-of-way is being cleared. 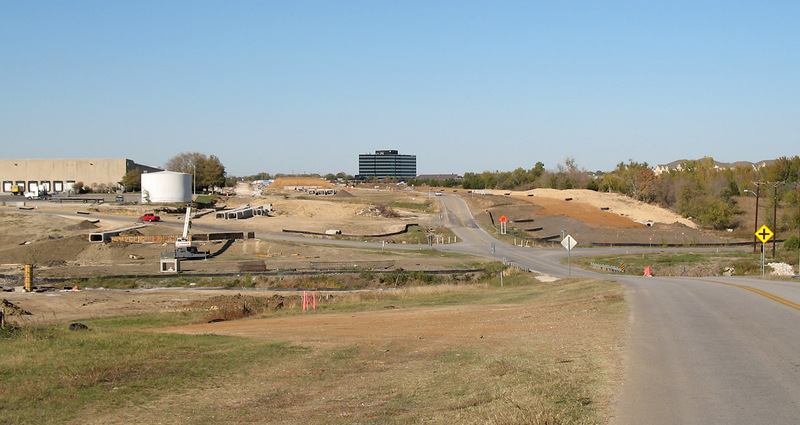 This view looks north at 19th Street and Carrier Parkway, which is the end of the active construction project. 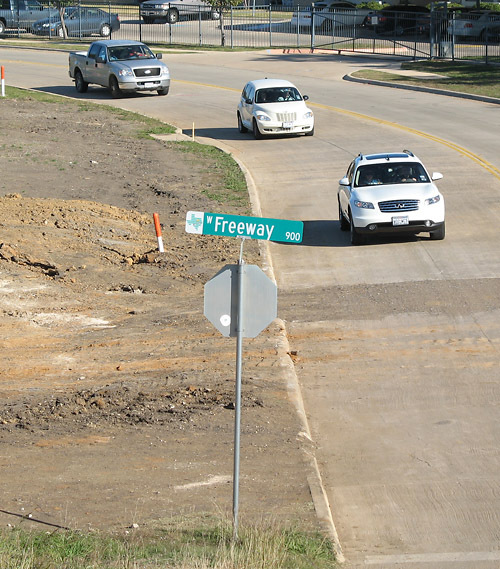 Here Highway 161 will veer away from 19th Street onto a new alignment. Ahead is park which was another source of controversy. 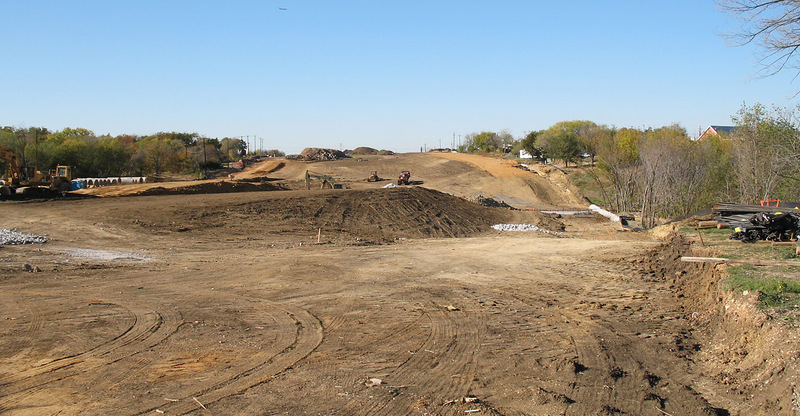 Remediation parkland is being purchased to offset the impact of Highway 161. 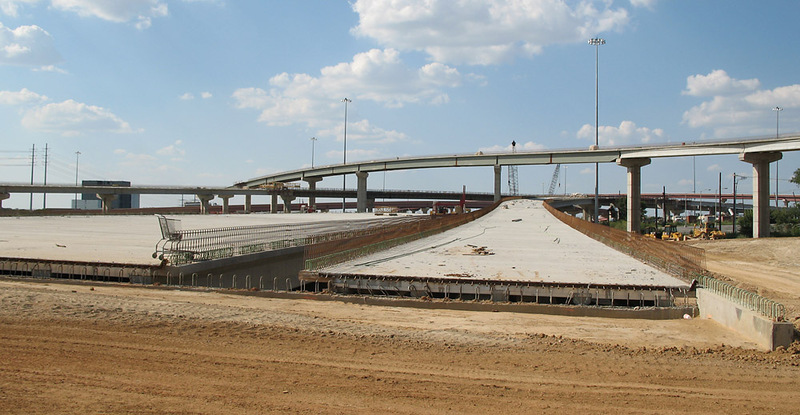 Further north at SH 183 (Airport Freeway), work on the interchange is nearing completion. There photos were taken on July 16, 2006. 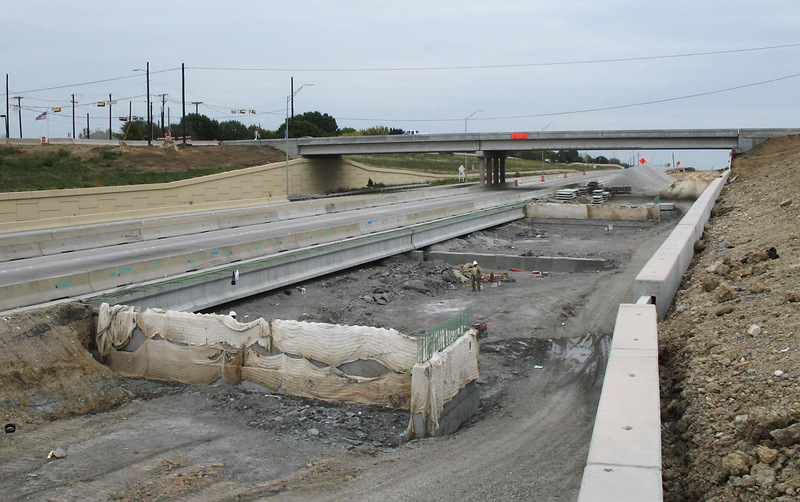 This view looks east-southeast along SH 183. 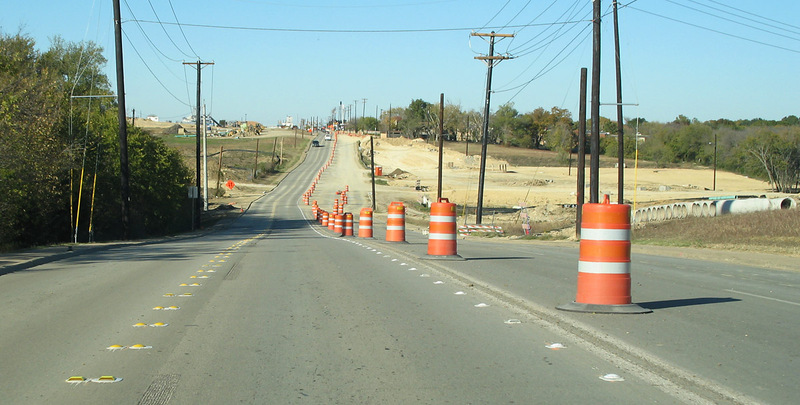 This view looks east along SH 183. This shows the Highway 161 main lanes. This project is being built with conventional (gasoline tax) funds, but I don't know if these lanes will be free or tolled. South of this interchange the main lanes will definitely be tolled. Another view of the Highway 161 main lanes. Looking north from the south side of the interchange. Looking south on the south side of the interchange. 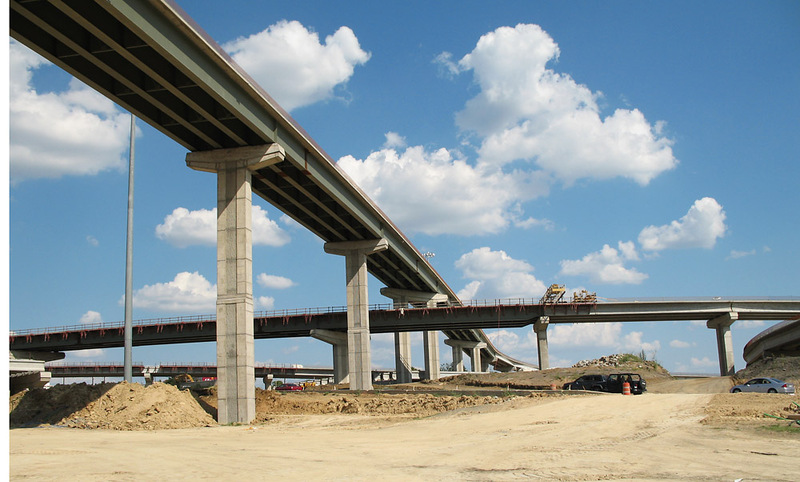 The tolled main lanes will continue southbound in the near future. Driver's view on an existing ramp.